A falling film evaporator is used in industries to concentrate liquid especially heat sensitive materials In this type of evaporators the liquid is feed from the top of the evaporator design of the product distribution system in the evaporator is such that the product wetting of the tubes should be full and evenly. The product is distributed into the heating tubes in a form of thin layer and it flows downwards at boiling temperature and start evaporating. The product and the vapors goes into the separator where the both is separated and vapors is forwarded to next effect. This type of evaporators can be operated with very low temperature differences between the heating media and the liquid. 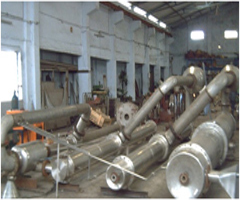 The effect of this type evaporator depends of the capacity and type of product. While designing number of effect is calculated considering steam economy and cost.